This is the short version of the first semiconductor manufacturing Tutorial INFRASTRUCTURE produced back in January, 1997. We created this Tutorial after being asked by SEMI to explain the technology in an understandable form. Later versions of the Tutorial added detailed positioning of chip equipment companies in the process flow. Admittedly, new steps have been developed in semiconductor process technology since this Tutorial was first published but, we can confidently say, all of the steps detailed here remain relevant. As you can see by the copyright on the bottom of each image the on-line version of this was not released until 1999. Clicking on any image should generate a view of all the images at the bottom of your browser. The descriptive text, however, will not show up in this view. I will be adding verbiage and later versions of this Tutorial in future updates. The process flow for semiconductor manufacturing is best considered in two sections, the "front-end" and the "back-end"
The "front-end" is wafer processing which is performed in a Wafer Fab area. The process of wafer fabrication is a series of 16-24 loops, each putting down a layer on the device. Each loop comprises some or all of the major steps of photolithography, etch, strip, diffusion, ion implantation, deposition, and chemical mechanical planarization. At each stage, there are various inspections and measurements performed to monitor the process and equipment. Supporting the entire process is a complex infrastructure of materials supply, waste treatment, support, logistics,and automation. It has the cleanest environment in the world - many times cleaner than the best hospital operating theater. A Fab is one of the most complex industrial facilities to be found anywhere. A state-of-the-art Fab, costing over $1 billion, has a denser capital per square foot than any industry. The "back-end" is Test, Assembly and Packaging, where the finished wafer is split up into individual die (chips) which are then assembled into packages which can be handled in the final applications. Full functional electrical test is performed at both wafer and package level to ensure outgoing quality. The wafer growing process is similar to crystal growing experiments that most of us did at school. A seed crystal of silicon is immersed in a bath of molten silicon. It is slowly pulled out, and because crystal growth occurs uniformly in all directions, the cross section is circular and, as it is pulled, it forms a cylindrical ingot of pure silicon. The ingot pulling process lasts for almost 24 hours and produces a cylinder of diameter larger than is desired. The ingot is ground down to the required diameter, and then is sliced into individual wafers. At this stage, the wafers have a rough texture and need to be finely polished to meet the surface flatness and thickness specifications. To give you an idea of how critical the flatness specification is, consider the following analogy. If an airplane were to fly across the Pacific Ocean and hold its altitude to within 30 feet of the ocean surface, then this would be equivalent to the flatness specification of a wafer. The whole semiconductor manufacturing process hinges on the use of a photographic process to create the fine featured patterns of the integrated circuit. 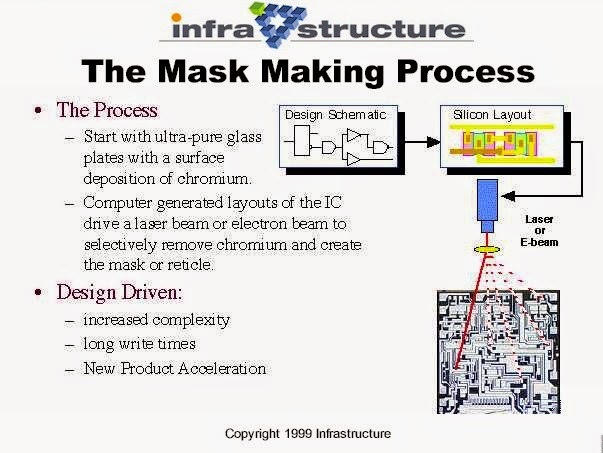 Each layer of the chip is defined by a specific mask, and there are 16 to 24 mask layers in each IC. The mask is somewhat like a photographic negative, which is made by patterning a film of chromium on a pure quartz glass plate. These finished plates are called reticles. Reticles are manufactured by very sophisticated and expensive pattern generation equipment, which is driven from the chip design database. The patterns are formed on the chromium plated quartz plated by removing the chromium with either laser or electron-beam driven tools. As transistor features are reduced, more components are placed on each chip, requiring larger, more complex patterns to be drawn. This all takes longer to write the masks. Each new design or die shrink requires new mask tooling, so this segment is driven by new product acceleration. Crystalline or contaminate defects will kill the operation of an IC, so it is imperative that the silicon is ultra-pure. In order to create the best possible quality of silicon, a pure layer of silicon is grown on the raw wafer via an epitaxial growth process. This is known as the epi-layer. This layer is very thin - approximately 3 percent or less of the wafer thickness. As device complexity grows, the need for epi-wafers increases. Photography is the best analogy to describe the photolithography process. The stepper is like a photographic enlarger where a light source projects an image through a lens system onto photographic paper. In the semiconductor case, the "light bulb" used to be a mercury arc lamp, but for DUV lithography has been replaced by excimer laser light sources. The image comes from our reticle, and this is then projected through a very complex quartz glass lens system on to the wafer which has been coated (spun-on) with an ultra-thin layer of photoresist material. The reticle image is either printed 1:1 in size or reduced by 4:1 or 10:1, depending on the particular stepper. Clearly, for a 4:1 reduction, the features on the reticle need only be one-fourth of those required on the wafer. The exposure time is dependant on many variable including the sensitivity of the resist, lens aperture, etc. The machine used to do all of this is called a "stepper" because it literally does one die or a few die at a time, then steps to the next die or set of die until it has exposed the entire wafer. Now we will start to construct the transistors on the wafer. The first step is to heat the epi-wafer to grow an oxide layer - silicon dioxide. At this point, we go to the lithography process, spin on photoresist, bake it to make it harder, expose the reticle step-by step over the wafer, then develop the resist to create the pattern on the wafer. The deposition, diffusion or implant processes that follow would actually destroy the photoresist, so the next step is to transfer the pattern from the photoresist to the tougher oxidelayer. The wafer with patterned photoresist is then put into an oxide etch process to remove the oxide where there is no pattern. This has the effect of transferring the pattern to the oxide, creating barriers of oxide where we do not want subsequent processes to impact the silicon below. The etch may be either a classic wet chemistry or a "dry" etch which uses gas excited by a radio frequency generator to and excited plasma state. At this point, the photoresist has served its useful purpose and must be removed. This process is called "strip". The stripping of photoresist must beentirely complete since this is an organic material which, if left on the wafer surface, would cause defects. To do this effectively, chipmakers often use both "wet" and "dry" strippers. The classic approach to creating pockets of silicon with different electrical properties was to deposit a dopant material, such as Boron, on the surface, then diffuse or drive it into the surface of the silicon by exposing it to controlled periods of high temperature. As device geometries have become smaller, the side-ways diffusion has become more difficult to deal with, so the industry has converted to the ion implantation process. In implant, the dopant molecules are implanted vertically into the surface of the silicon by a high-energy ion beam. This penetrates the silicon vertically without any appreciable side-ways diffusion. By removing and re-growing the oxide layer, we can then repeat the previous lithography, etch and strip processes with a different mask to create a window opening in the oxide where we want to build the transistor's gate region. The gate is a conductive layer which is separated from the bulk silicon by a thin gate oxide. A positive electrical charge on the gate will create an opposite negative field in the surface of the silicon. This negative field essentially creates a conductive channel between the source and the drain, letting current flow between them. The gate oxide needs to be thin since the electrical field must transfer across this insulator. Typically, this is made by depositing silicon nitride film via a Chemical Vapor Deposition process (CVD). The gate itself is either made of polysilicon or a metal. Polysilicon is deposited by a Physical Vapor Deposition (PVD) process, often known as "sputtering". We saw how an oxide was used as a masking barrier to create diffused areas in the silicon. Various types of oxides are used for other purposes, usually to electrically isolate electrical paths or transistors from one another. Oxides can be grown by oxidizing silicon, or may be deposited on top of any material. Deep Field Oxides are grown into the silicon after more lithographic masking to electrically isolate each transistor from its adjacent partners. Dielectric isolation oxides are deposited in layers to insulate the transistors from the interconnecting layers which will be built above. Passivation oxides are later deposited on top of completed wafers to protect the surface from damage as they are handled and packaged. Again using reticles and photolithography, contact areas in the silicon dioxide are unmasked so that they can be etched all the way down to the silicon and polysilicon areas of the transistor's source, drain and gate regions. These holes, called "vias" are essentially chemically "drilled" holes which expose the contacts to the three-terminals of the transistor. To connect to the transistor's terminals, aluminum is deposited on the surface and down into the via holes. Another lithographic masking step is performed to mask off the areas where aluminum should remain, then a metal etch is performed to remove the excess aluminum. This leaves the metallization contacting only those regions which are required by design. Another oxide layer is deposited on top of the aluminum to electrically isolate it from subsequent steps. Note that each time a deposition or etch process step is performed, the surface contours get more developed and are often exaggerated. CMP (Chemical Mechanical Planarization) is an abrasive process used for polishing the surface of the wafer flat. It can be performed on both oxides and metals. It involves the use of chemical slurries and a circular (sanding) action to polish the surface of the wafer smooth. The smooth surface is necessary to maintain photolithographic depth of focus for subsequent steps and also to ensure that aluminum interconnects are not deformed over contour steps. A simple analogy here is that of an orbital sander used in woodworking. Imagine such a sander used with a wet chemical paste (slurry). To add the next layer of interconnect, first it is necessary to mask and etch via holes. Those are then filled with a deposited metal such as tungsten or titanium-tungsten, often known as a "plug", which will provide the electrical connection down between two layers of aluminum. With the plug in place, the next layer of aluminum can be deposited, masked and etched. This process can be repeated for up to 5 or 6 layers of interconnect for complex logic chips. Memory chips typically only have a couple of metal layers. Inspection and Measurement is a critical area in semiconductor manufacturing. Chipmaking deals with so many state-of-the-art materials, small features and precision, that the ability to measure and monitor the process is vital. Measurement is defined as the ability to precisely quantify the physical, dimensional, or electrical properties of materials. There are numerous measurement tools used in the Fab to monitor the quality of the process relative to its designed specifications. Generally, if all materials and processes are within specification, the the chip will operate as designed. Measurement typically applies to such items as wafer flatness, film thickness, electrical properties, critical dimensions (CDs), etc. Inspection is defined as the ability to observe and quantify defects. These tools include optical instruments and, with shrinking features down at the sub-micron level, scanning electron microscopes (SEM) must be used. As fine geometries get down to below 0.2 micron, the ability to observe these defects becomes more challenging and expensive. Inspection typically applies to such items as reticles (masks), wafers, etc. As chip densities increase, the volume of inspection and measurement data also increases - hence the need for sophisticated software tools for yield data management and analysis. Defects kill yield and drive up manufacturing cost, so defect inspection is vital in the Fab. Defects on the masks or wafers can cause electrical short circuits between aluminum lines that are not supposed to be connected together. They can also cause open circuits or breaks in aluminum traces. Either of these is fatal to the functionality of the chip. With millions of transistors per chip, one can see how defect control is critical. Defects originate either from the atmosphere in the Fab (hence the ultra-clean room requirement), or from the materials used, or from the tools that are used. For a given defect density in a Fab/process, the smaller the die, the larger the population of die per wafer, and the lower the statistical impact of the defects. Also, the smaller the defects are in size, the less is the chance that they will cause fatal problems. It is not only important to get yields up as high as possible, but it is also important to get them up to their attainable level quickly. Time is money, so a fast ramp-up of yield will get a Fab to profitability sooner. When the finished wafer comes out of the Fab, it is ready for the Test, Assembly and Packaging processes to finish it into a set of good, usable integrated circuits. Wafer test is often performed at a location near the Fab, so that yield data can be assessed quickly and fed back to correct and optimize the Fab processes. Assembly, Packaging and Final Test and often performed in a totally different facility - often on a different continent. Wafer probe or test is the first time that chips are tested to see if they function as they were designed to do. There are three basic tools used as a set to perform this operation. First, the wafer prober is a material handling system that takes wafers from their carriers, loads them to to a flat chuck, aligns and positions them precisely under a set of fine contacts on a probe card. Mostly, this test is performed at room temperature, but the prober is increasingly being required to also heat or cool the wafer during test. Secondly, each input-output or power pad on the die must be contacted by a fine electrical probe. This is done by a probe card, whose job is to translate the small individual die pad features into connections to the tester. Thirdly, the functional tester or automatic test equipment (ATE) is capable of functionally exercising all of the chip's designed features under software control. Any failure to meet the published specification is identified by the tester and the device is cataloged as a reject. The tester/probe card combination may be able to contact and test more than one die at a time on the wafer. This parallel test capability enhances productivity at wafer probe. 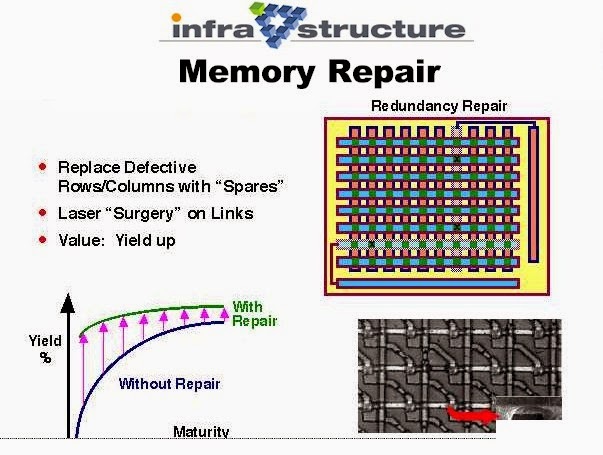 Redundancy Repair is a process step almost exclusively used for memory chips. The best way to think of this is via the analogy of the spare wheel in a car. The spare is a redundant fifth wheel carried and used in the event a defect occurs in one of the other four. Similarly, a memory is designed with redundant rows and columns (spares) which can be logically replaced for rows or columns which may contain defective memory cells. The replacement is made by special precision tools which take the wafer probe failure data, locate the failed element, and use a laser beam to perform micro-surgery on links to remove the defective element and connect in a replacement. Wafers arriving from Probe either have the reject die marked with ink dots or, the come with a map of the defect locations. The first step in Assembly is to saw between each die in both directions and separate or "dice" out the good die. Next, the good die are die bonded or attached onto the frame of a package. This attach may be with an epoxy adhesive or with a silicon-metal eutectic bond. Then, each pad on the die is connected to a corresponding pin on the package frame via a thin gold or aluminum wire (approx. 0.001" diameter). There are new methods of interconnect evolving, such as flip-chip, but wire bond is still the dominant method and is likely to continue to be for many years. Finally, the bonded die and frame are sealed - either by a molded plastic compound, or by the attachment of a sealed lid. Depending on the package type, the pins or leads may have to be trimmed and formed to the desired shape for use in applications. Package test is the last time that chips are tested to see if they function as they were designed to do before leaving the factory. There are three basic tools used as a set to perform this operation. First, the handler is a material handling system that takes packaged devices from their carriers, loads them into contacts or sockets and sets the environmental temperature as specified. Secondly, each pin on the chip's package must be contacted by inserting it into a contactor or socket on a custom designed PC board known by many as a DUT Board or Load Board. Thirdly, the functional tester or automatic test equipment (ATE) is capable of functionally exercising all of the chip's designed features under software control. Any failure to meet the published specification is identified by the tester and the device is binned as a reject. The tester/handler combination may be able to contact and test more than one part at a time in parallel for increased productivity. Often, chips are tested at more than one temperature, so each chip may be tested two, three or more times before being shipped. These few slides have expressed conceptual descriptions of the major process steps involved in semiconductor manufacturing. It is not intended that this is an exhaustive or complete list of the 400-plus steps that are typically used to make semiconductors. We hope that you have enjoyed this tour through chipmaking with us, and encourage you to visit the rest of our website and subscribe to our publications. On a weekly and monthly basis, we write about different elements of semiconductor manufacturing, the companies and the markets. In the full seminar presentations, we go into more detail on each process step; describe the challenges and opportunities associated with each step; describe some of the new emerging technologies; discuss the Technology Roadmap critical issues; and identify the companies who participate in each sector. Thank you for joining our tour!